Japan isn’t the only place that gets giant Gundam statues. Hong Kong gets them, too. 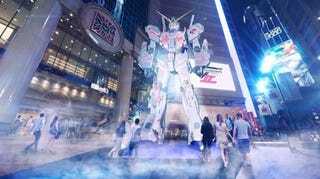 As the Gundam Global Portal Facebook (via tipster Mox Factor) points out, this summer another big Gundam is coming to Hong Kong’s Times Square. Back in 2013, the area hosted a Gundam display with an RX-78 Gundam squaring off against a Char’s Zaku II. The upcoming display with feature a 1/3 scale Unicorn Gundam and a Wing Gundam. What’s more, Hajime Katoki’s Gundam art will be displayed outside of Japan for the first time. This year’s Gundam display will be shown at Hong Kong Times Square from August 1 to August 31.